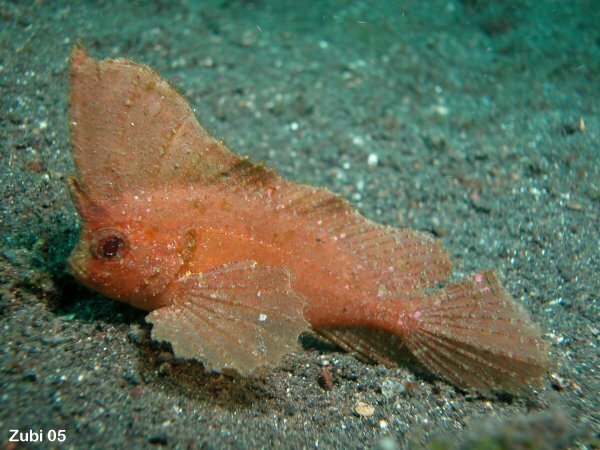 This waspfish is one of many found in Lembeh, one of my favorite divesites in Indonesia. It is amazing what can be found at one place: several types of waspfishes, velvetfishes, stonefishes, ghost pipefishes, seahorses, frogfishes and many nudibranchs. Waspfishes have venomous spines and typically sway from side to side with their bodies to look like a piece of leave or debris. Look at the similar cockatoo waspfish (Ablabys taenianotus) and the longspine waspfish (Paracentropogon longispinus) which is even smaller and very cryptic. Dieser Stirnflosser hat ein im Gegensatz zu andern Arten eine weisse Schnauze. Der Schaukel Stirnflosser (Ablabys taenianotus) sieht ähnlich aus, hat jedoch 17 anstatt 15 Rückenflossenstrahlen. Der Langstrahlen Stirnflosser (Paracentropogon longispinus) ist kleiner mit einem schönem Muster. Der Tauchplatz in Dauin ist wirklich beeindruckend, eine Vielfalt von seltenen Tieren sind hier zu finden, von Geisterpfeifenfischen, über Steinfische, Samtfische, Seepferdchen, Anglerfische etc.